"With the new Rebar, fans will immediately recognize the iconic box-like body and sloped-neck design found in the Super Tool 300 and Micra. This new soon-to-be favorite rounds out Leatherman's classic "heritage" line of products by offering one in each size category. Just like the Super Tool 300, the Rebar pliers have been optimized for strength and feature replaceable wire/hard-wire cutters a first for a four-inch tool from Leatherman. With all the features to get even the toughest jobs done, in a smaller, slimmer size, the new Rebar is sure to be an instant hit on job sites and home-projects the world over. 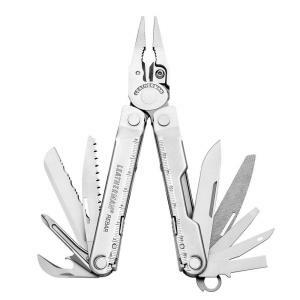 Tbook.com crawls the web to find the best prices and availability on Leatherman and related Tools and Hardware products like Leatherman Tool Group Rebar 17 Full Size Multi-Tool. For this page, related items include products we find that match the following keywords: "Leatherman" at our vendor partner Home Depot. Leatherman Tool Group Rebar 17 Full Size Multi-Tool is one of 14 Leatherman and related products listed in the Tools and Hardware section of Tbook.com If you have any questions on this product, please give us a call at 734-971-1210 during the hours of 9am - 5pm EST for assistance. Thank you for shopping at Tbook.com, the Internet Department Store!